When I talk to customers, I see an increase in interest in XACML for the .Net framework and the C# language. Historically, all XACML implementations have been in Java, most of them stemming from SunXACML. It is the case for instance of WSO2’s offering, SICSACML, and of course Axiomatics’ Policy Server. Axiomatics and other companies have since released .Net PDPs and cover the space fairly well. In addition, it is possible to develop WS clients to SOAP-based PDPs regardless of the technology used. 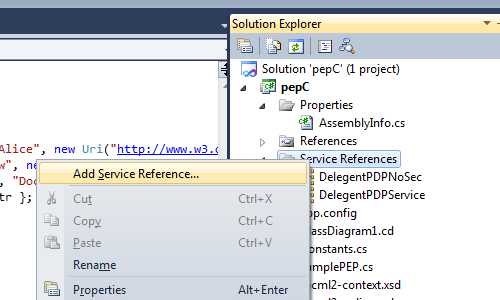 The tutorial hereafter focuses on a C# example built using svcutil and the Axiomatics Policy Server’s SOAP-based PDP. With this code, it is therefore possible to invoke the Java-based SOAP-based web service from any .Net application. The .Net framework comes with a little utility called svcutil. This utility can generate client stubs from a WSDL such as the one that comes with the Axiomatics Policy Server. Using svcutil (or the add service reference… option in Visual Studio), let’s generate the client stub. Use the Add Service Reference to generate a C# client stub for the Axiomatics Policy Decision Point. This will bring up the following dialog where one can type in the path to a WSDL that describes any service for which one wants to create a client stub. In our case we can browse to our PDP service. In this example, the Axiomatics PDP is running locally inside an Apache Tomcat 7 web server. It is exposed as a SOAP web service. the generation of a C# file called Reference.cs which contains the client stub and serialization code. the creation of a default configuration file, App.config, which contains the configuration for the endpoint such as the URL, the type of security and binding as well the message formatting. You can find more information on these files at Microsoft. 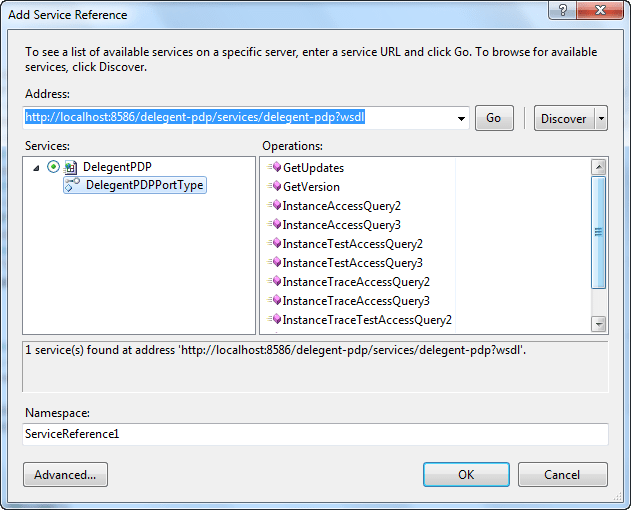 Use the Add Service Reference to browse to the PDP's WSDL and add a C# client stub. What we now want to do is add a main method and an instance of the service reference we just added to our project. We can also call the GetVersion() method of the PDP which returns the product version (e.g. Axiomatics Policy Server 4.0.6). Let’s now focus on the actual authorization methods. The Axiomatics Policy Server includes a XACML 3.0 PDP which expects a XACML request and sends a XACML response back. The method we need to use to send a XACML request is InstanceAccessQuery3(…). We can simply add the line client.InstanceAccessQuery3();. However this method needs a parameter, namely the SOAP-wrapped XACML request. Let’s start from the beginning then and start creating a XACML request, bundle it inside the SOAP message and pass to our WCF SOAP client stub. Alice would be a subject identifier and belong to the subject category. An attribute in XACML is in fact made up of a bag of values (attributes can be multi-valued). Each value has a datatype (e.g. String, integer… Usually XML datatypes) and 1 or more values. Now, since attribute values can be any content as per the XACML 3.0 schema (see below), this means that svcutil generates classes that will require XML nodes to be built to set the value of an attribute. This is not particularly friendly and we will factor that away in a later part of this tutorial. First off, let’s create the attribute that will represent the subject id Alice. We will start from creating a string that contains the value Alice. In a real scenario, this value would be read from an authentication mechanism. We now want to store that value inside an AttributeValue. To do that we must use the objects generated automatically by svcutil. In the code above, note that we specify the data type of Alice. Most of the XACML datatypes are directly taken from XML itself. The list is defined in the XACML 3.0 specification. Also note we use an array of AttributeValueType1 since there can be several attribute values per attribute in XACML (the multi-valued nature of XACML attributes). In the above code, note the use of IncludeInResult. This relates to the ability of a PDP to return the attributes initially sent in the request along with the decision. This is useful when using the Multiple Decision Profile. Also note that attributes can have an issuer. This is used in the matching process of the evaluation of a XACML request against a XACML policy. Now that we have attributes and their values, in this case subject-id and Alice, we can group them (it) inside a given category. This is what the code hereafter does. Category identifiers are defined in the XACML 3.0 specification(section 10.2.6). In this case we use the subject category identifier, urn:oasis:names:tc:xacml:1.0:subject-category:access-subject. We can now group together our different categories into an array of categories as below. We then build a XACML request from which we derive a SOAP request (merely the wrapping of the XACML request inside a SOAP message). The InstanceId attribute in the code above refers to which PDP instance the request should be sent to. The Axiomatics Policy Server PDP has a multi-tenancy model and the PDP instance id helps identify to which particular instance the XACML request should go. In the following code, we simply pass the XACML request to the client stub method to invoke the PDP service. Notice how the answer received can contain multiple results, each of which boasts a single decision. This, again, is due to the Multiple Decision Profile which supports sending and receiving multiple XACML requests in a single network exchange (e.g. SOAP request/response). The code to create a single XACML attribute is fairly lengthy and repetitive due to the automatic code generation done with svcutil. To get around that, let’s create a small utility method which creates the right type of attribute object from the simple building blocks of an attribute: its id, value, type, and issuer. With this small utility in hand, we can rewrite our example in a more efficient way. Below, I have included an entire simple SamplePEP class which you can use with the Axiomatics PDP. This all look so awesome!! It’s the only implementation of XACML for .Net I could find so far. I am just wondering what licence applied to the PDP.Net and how I can get hold of it? Is it a commercial product and you can use it for academic research? Hi, I wrote you back ever since. Axiomatics is putting an academic license in place for students so stay tuned. the reference using com.axiomatics.xacml; is this a dll that comes with Axiomatics PDP server? and XACML request of type REQUESTTYPE1 is it referring to that dll? Please let me know. No. In the example I used Visual Studio (svcutil) to generate all the bindings and classes from the PDP server. Axiomatics does provide a .NET SDK but it’s not used in this example.